We held our company summer outing at a rest house in Anilao owned by one of our co-workers. It was indeed the best decision we made as Anilao being known to be one of the most visited diving spot in the Philippines surprised us a lot with its beauty even though we were no divers at all. With the used of Waze app, we were able to arrive there fifteen minutes before twelve noon, considering that we left Manila by nine in the morning. Let me discuss the things that made our Summer outing real fun. 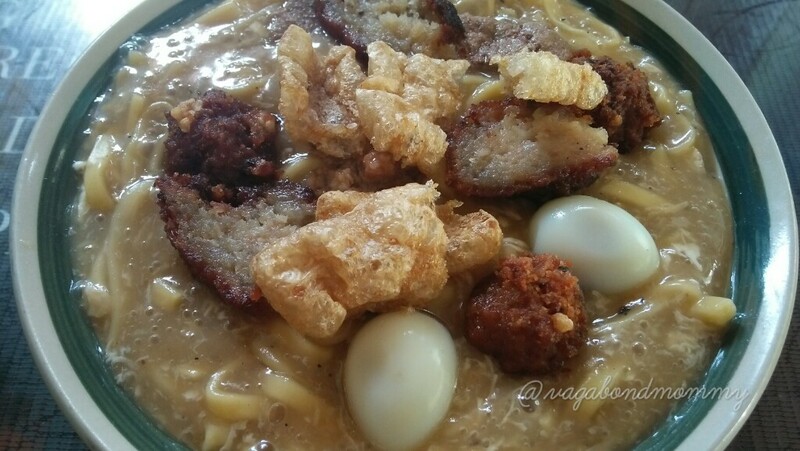 Before we head to the rest house, we tried the known Batangas lomi on one of the restaurants we saw on the road. A must try food from Batangas, this was cooked differently, thicker than the one we know in Manila, but the taste was superb. The rest house we stayed at is owned by our co-worker and his family. It is about 1000 square meter lot where in a three storey house suited for a family vacation was built fronting the beach. The first floor and the second floor are air-conditioned rooms with bathrooms each. The bathrooms are big enough with hot showers. Third floor is like a balcony type made floor, which is good for just pure relaxation. Aside from that, there is a newly built house for the caretakers with balcony on its second floor for the guest located beside the main house. The place is well thought off I must say. This is the main house, first to third floor. The balcony at the third floor. View from the balcony located on the second floor of the caretakers house. Beautiful isn’t it? Relaxing view while resting at the balcony during the night. I have been to a lot of beaches in the Philippines, and I usually looked for smooth sands and nice beach in general. Anilao has a rocky shore different from what I am used to but just like the others it has very clear water too. What I love about being there was that it gave me a sense of privacy as it was that touristy. It gave me a peaceful and calming vibe, the water is too inviting for you not to try to swim in it. But the best thing that I appreciated about the place was the presence of the things I would discuss next that my co -worker used to describe as his toys. Oh! If only I could stay longer! At exactly four in the afternoon, Sir Aldrich, the owner of the place showed us the “Hobie”. I went to try this with him and another co-worker and her girl friends. Sir Aldrich operated this with the help of their caretaker. I am so amazed as Hobie depends solely with the wind to work. So we were very lucky that the wind was enough amount of wind needed to run it that time. It was a very unforgettable experience for me, not only because it was free but the experience itself really thrilled me. I later found out that what we did was known as Catamaran. Wikipedia defined it as a “multi-hulled watercraft featuring two parallel hulls of equal size. It is a geometry-stabilized craft, deriving its stability from its wide beam, rather than from a ballasted keel as with a monohull sailboat. Being ballast-free and therefore lighter than a monohull, catamarans often have a shallower draft (draught) than comparably-sized monohulls. The two hulls combined also often have a smaller hydrodynamic resistance than comparable monohulls, requiring less propulsive power from either sails or motors. The catamaran’s wider stance on the water can reduce both heeling and wave-induced motion, as compared with a monohull, and can give reduced wakes. ” I guess those who love boats would appreciate this more, though even if I am not a boat enthusiast I was able to really love the experience. 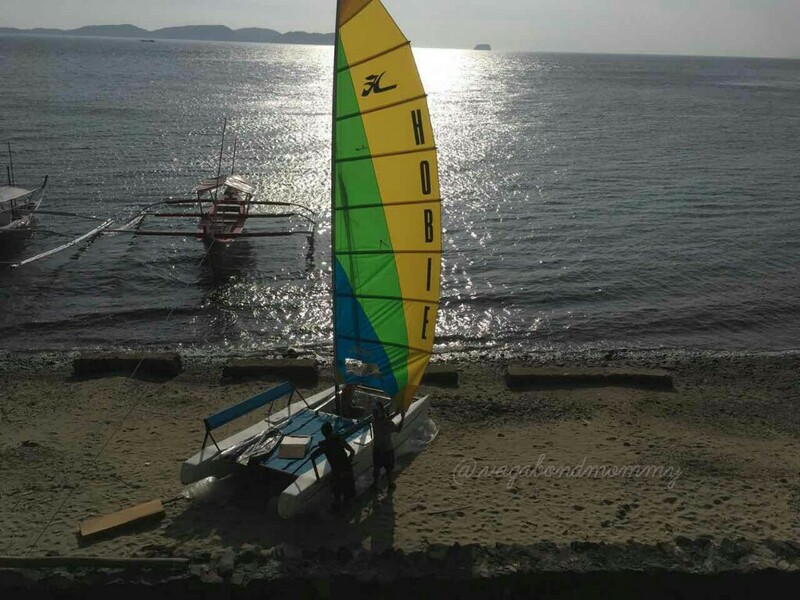 The Hobie, Catamaran getaway. Bringing the party at the sea. We sailed until six so we were able to see the sunset. What a beautiful scene to watch while on the sea. When we headed back, we shared a sumptuous dinner prepared by another co-workers wife. It was something that I have loved about our outing too. Food were all healthy and delicious. Then we spent the night with an open sharing until two in the morning. We were served with good breakfast prepared by the wife of Sir Aldrich’s caretaker. Some of our co-workers headed back to Manila after it. However, I stayed a little longer to try other activities with three other co-workers. And I am thankful that I did! Sir Aldrich being the hospitable host he was lent us his newly bought snorkeling gears that we could use to see the hidden treasures of Anilao. 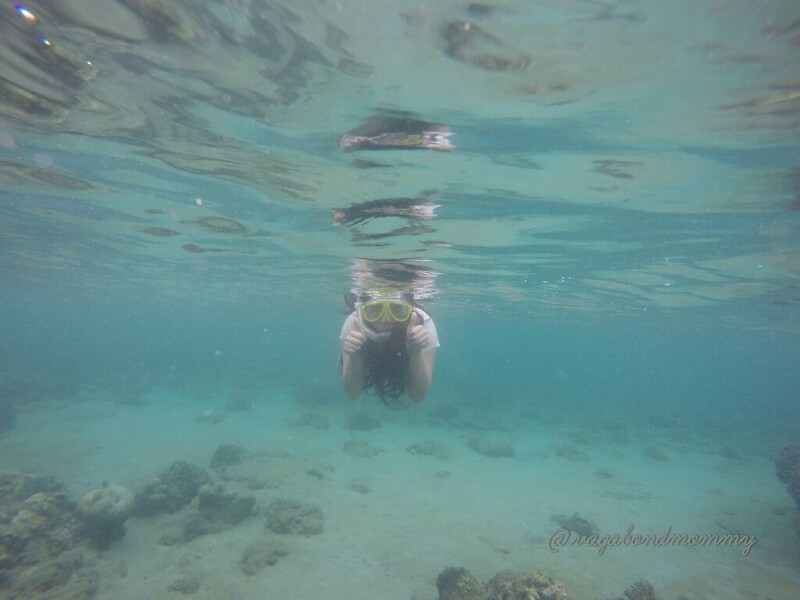 We really had fun taking pics and videos of the fishes there, we did this just 150 meters away from the rest house. The next thing we tried after snorkeling was Kayaking. 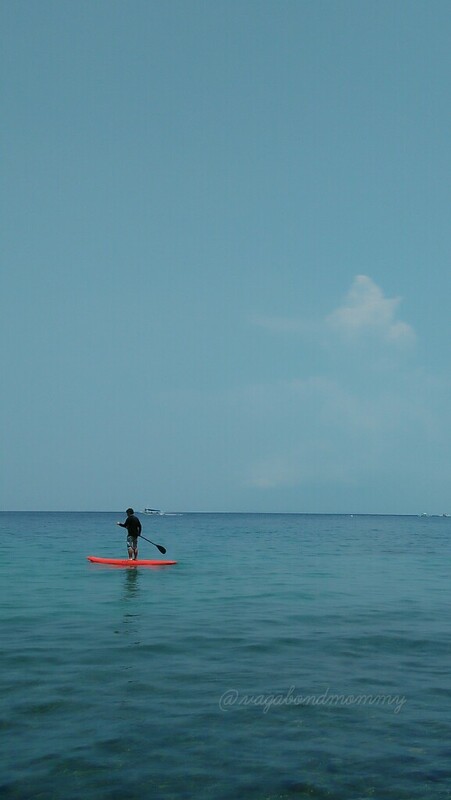 My second time to do kayaking. This time I did it with two of my girlfriends, and it was nothing but fun. I didn’t expect that at this outing I will be able to try paddle boarding, I have always seen people doing this in Boracay. I just don’t have the chance to try it, maybe because it is pricey in Boracay too. I thought I will not be able to do it, but I am glad that at first try I made to balance myself well on it. It was cool experiencing it for the first time, nothing cooler knowing that it was free. Yes, it was free. Hehehe! Sir Aldrich, showing me how to do paddle boarding. Glad I am a fast learner with things like this. Hehehe. That was the last thing we have tried before we head back to Manila, we we were not able to try some others toys he had like the speedboat and the windsurf. But I am sure that was not the last time we will be there. Hehehe! 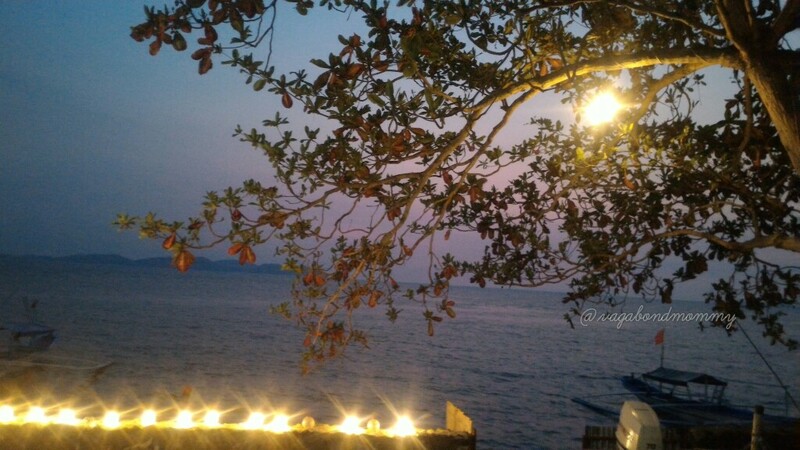 Anilao will now be in my “wants to go back list”. 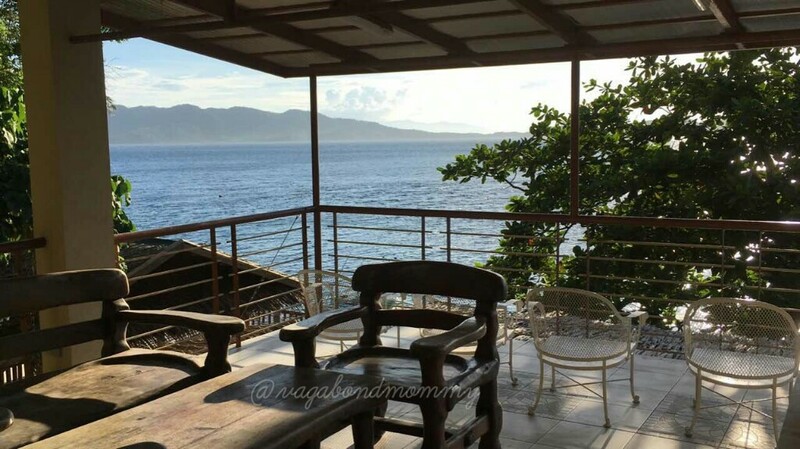 Anyway, the rest house featured here is privately owned and only accepts guest per invitation but if you want to see this place for yourself you may contact the owner through this blog by simply commenting on this post. I assure you that just like me, you will definitely have a great time at Anilao.